Get ready to put on some shades because these neon lights certainly are blinding. 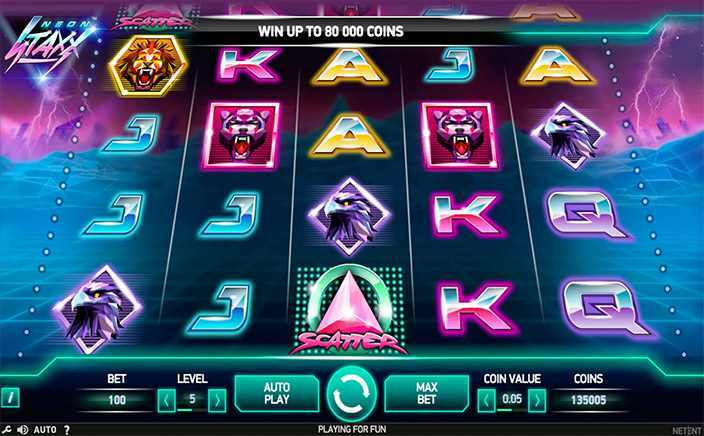 The Neon Staxx slot game is guaranteed to have you mesmerised with the lights blazing in the game, as well as some of the interesting cash prizes up for grabs. 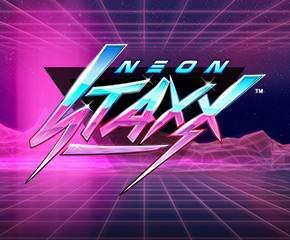 Neon Staxx is brought to you by NetEnt, a game developer that all casino players are happy to swear by for their top quality entertainment. The game boasts some amazing graphics and features, all of which are a testament to NetEnt’s brilliant style. Neon Staxx is a 5 reel, 4 row and 40 payline video slot game that features plenty of neon! The game is set in what appears to be some sort of cross between a retro and futuristic interface, but it’s certainly keeping things bright and interesting. To start playing, decide what you would like to bet on each spin and then click the Spin button. Wild substitutions: The wild in the game is the one with the word Wild inscribed on it and can be used to swap out other symbols so that you can make a winning payline. You cannot use the wild sign to swap out the scatter symbol in the game. Super Staxx feature: This feature makes certain of the reel signs become stacked so that you can earn some massive payouts. The neon animal signs are of differing values, so there’s a lot up for grabs if you get the high value symbols as stacked symbols. Free spins: The free spins round is triggered when you get three or more of the flashing triangular symbol. Three of the triangular symbols get you 10 free spins, 4 of them give you 15 free spins, while 5 of them give you 20 free spins. Any stacked symbols that you got while entering the free spins round remain stacked so that you can make even more money off your wager. While the graphics might get a little too glitzy for your tastes, Neon Staxx certainly has a lot going for it in terms of payouts and playability. This is a low to medium variance game that allows you to make a maximum of 400 times your bet! The best features of this game are undoubtedly the Super Staxx feature along with the free spins round, both of which make for some good returns on your deposit. If you aren’t too put off by the neon interface of the game, you can look forward to some great payouts if you are lucky, so try out this game when you can!